CaribPR Wire, PORSTMOUTH, Dominica , Tues. Feb. 25, 2014: Dominica hotelier, Gregor Nassief, is urging St. Vincent & the Grenadines Prime Minister, Ralph Gonsalves, to step aside as chairman of the shareholder’s committee of regional airline LIAT, in a fourth open letter to the shareholders. Nassief insists that since Gonsalves believes LIAT can never be profitable, then the airline urgently needs a new chairman and ‘general’ who can find a new approach for taking LIAT and the Caribbean aviation industry forward without a perpetual and unfair burden on the treasuries of St. Vincent, Antigua, Barbados and Dominica. The open letter follows. On the televised program Time to Face the Facts on Sunday, February 23rd, I appealed to you to step aside as Chairman of the Shareholder’s committee of LIAT. As mentioned on the program, given the respect and admiration I have for you, particularly on your stance and leadership on issues such as reparations and the cholera outbreak in Haiti, it was personally difficult for me to do this. But it is necessary. LIAT has moved from an operational meltdown in the Summer of 2013 to a financial meltdown a mere 7 months later. LIAT drains our treasuries, operates inefficiently and stifles competition. The source of LIAT’s problem is its financial unsustainability and as with everything else at LIAT, no one is accountable. As Chairman of the Shareholder’s committee, the buck stops with you. LIAT needs to fight the battle of its life to transform itself to be financially viable and sustainable. But you believe, and have stated so publicly, that LIAT can never be profitable. This battle, therefore, needs a different general. LIAT has lost ec$120m in the last four years. Last month, LIAT could not pay both the lease on its aircraft as well as its payroll. So it chose one and delayed the other. A leased ATR gives 36% more seat capacity than its closest Dash 8 equivalent but is double the (lease) expense. In 2015, repayments will begin on LIAT’s recent loan of us$65m to purchase new aircraft. So monthly cash outflows go up even more. And the new inflows to cover this? Inter-island tourism is down 60% in 7 years and LIAT’s load factor is running at about 55%. The fantasy (aka “business plan”) is that the load factor will go up to 75%. The fantasy is also that LIAT will fly its way out of losses by expanding to new destinations – Jamaica, Haiti, Aruba, Panama, and eventually to cities in North and South America. LIAT employs 850+ people, flies 22 destinations, operates between 10 and 12 aircraft from 2 hubs (3 if you count Trinidad) to move 800,000+ passengers a year to generate massive losses. So it’s bail out time again. Call on shareholders, and call on other good neighbors so that we can continue to drain our treasuries, operate inefficiently and stifle competition. And for you this is acceptable because LIAT should not be run like a business and can never make a profit. Our fragile economies can no longer support perpetual bailouts. If we do not take the bull by the horns LIAT will go out of business – it will employ no one, fly nowhere, operate no aircraft and use no hubs. But alas, it will generate no losses and competitive players will fill the gaps because LIAT, the airline unfairly propped up by perpetual subsidies, will not be there to run them out of business. LIAT must therefore immediately begin a journey towards financial sustainability to save itself. But if the leader does not believe in the journey, then the journey will never begin. It is on this basis, with full respect and admiration, that I ask you to step aside as Chairman of the Shareholder’s committee, so that a new mandate to make LIAT financially sustainable can be ushered in. The new chairman of the Shareholder’s committee needs to believe that the battle can be won. And what needs to be done is not rocket science. Appoint a Chairman and a Board capable of turning around the financial fortunes of the company and running a top-notch airline. Give them the authority and autonomy to do what needs to be done. Allow them to appoint a CEO and restructure the management team as necessary. Allow LIAT to become a real business free from political interference tasked with a perfect safety record, high employee satisfaction, great customer service and solid financial performance. A fierce focus on the company’s finances with adjustments made to yield (including renegotiation of government/airport taxes), network efficiency and operating costs will be required. The resulting operation will have fewer employees, fewer destinations and fewer aircraft. It will be profitable, dependable and it will deliver great service. Like any airline, unprofitable routes will continue only with guarantees from the interested party/government. But at least then, the taxpayers will know what they are paying for, and can make that decision. And other/smaller airlines will take up the slack. Competition will flourish, as will LIAT, and the Caribbean will finally get the airlift network it needs. With a restructured board and executive, confidence in the airline’s financial performance will be established and other Caribbean governments may even want to invest. At the right time, joint venture the company while maintaining a minimum 50% shares among shareholder governments. The two best run airlines in the world (Singapore Airlines and Air Malaysia) are run like a business and are profitable and remain owned 50% or more by the State and 50% or less by private interests. Like LIAT, they were bleeding losses and their shareholder governments could no longer manage the bailouts. So they took the tough decisions, appointed the right board and executive team, and turned the airlines around to the benefit of all stakeholders. Yes, it will be painful, but it is necessary. And most importantly it will pull LIAT back from the financial cliff and put it on a course to long term financial sustainability. Please consider that I am a hotelier from an island that is almost 80% dependent on LIAT for airlift. Cut one route to Dominica, and we/Dominica will suffer. But if my option is (a) to continue to have all the LIAT routes we have today with an airline that is prone to poor service, ad hoc cancellations, occasional and irrational pilot strikes and constantly at the edge of a financial precipice due to insurmountable financial losses – OR – (b) an airline with fewer routes but with good service, dependable schedules and solid financial performance, then my choice is definitely the latter. And other airlines, once permitted, will take up the slack. Thomas Edison said, “I have not failed. I’ve just found 10,000 ways that won’t work.” And then finally, he invented the electric light bulb. We have lived through and exhausted the many ways that LIAT won’t work. It is time to try the way that will. I appeal to you, Prime Minister Gonsalves, as well as the other Shareholder Prime Ministers, to mandate a new approach for taking LIAT and the Caribbean aviation industry forward without this perpetual and unfair burden on our treasuries. It is time to run it like a business before it goes out of business. p.s. As we again desperately seek additional funds for yet another bailout, make it the last please. Don’t put the money into the black hole of an unsustainable business model. Instead, use it to restructure the airline, rationalize its operations and place it on a solid long term footing. In other words, make it the last bailout! CaribPR Wire, BRIDGETOWN, Barbados, Tues. Nov. 26, 2013: The Caribbean Advertising Federation (CAF) took home an impressive number of ADDY awards in 2013, confirming that the talent coming out of this region is bright and widespread. On Wednesday December 4th, 2013 the Caribbean Advertising Federation (CAF) will be hosting a workshop at Accra Beach Hotel & Spa, Barbados for attendees to view last year’s national ADDY winning submissions. To win an ADDY at national level means to create advertising that stands out against over 40,000 competing pieces. The CAF workshop serves to showcase the brilliant work created here in the Caribbean, to not only our regional counterparts, but also to our wider audience across the USA. It will also teach attendees how to use this year’s newly developed software for submissions, which are due on January 4th, 2014. Winning Caribbean ADDY pieces are entered into the fourth district competition along with South Florida winners. In last year’s awards, agencies that are part of the CAF took home an impressive amount of awards in almost every category. Everything Slight Pepper won a Charlie Award for Best of Sales Promotion and also a Gold ADDY for Single Unite Packaging for 3ZERO Rums by 3ZERO Ltd.
2013 was the first time in history a Caribbean agency has won a district Charlie Award. Trinidadian agency McCann Erickson took home the District’s coveted Mosaic Award that recognises cultural diversity. Terri Brown, our founder and ADDY Chair, won The Jack Phillips Gold Medal award. This is the highest honor in the AAF Fourth District. This award is given in recognition of outstanding contributions to advertising and furthering the industry’s standards, creative excellence, and public service. This not only shows the superior level of talent our Caribbean Universities and Colleges are churning out, but also how this talent is being used to create such dynamic advertising. CAF members, marketing agencies, freelance talent, creative students, and marketing managers are the attendees who will be part of the workshop on the December 4th. The purpose of this workshop is to launch and review the process for this year’s award submissions. The new software will make submissions easier, less expensive and less time consuming than previous years. Terri Brown will be hosting this part of the workshop and providing an overview as well as tips for this year’s submission. “The CAF was able to shine in last year’s submissions, but in seeing all the great package designs on our shelves and moving to radio jingles, there is a whole lot more that is award-worthy. We are looking to make this the best year yet for CAF,” says Renae Quinton, President of CAF. Once the software is learnt and the agencies are ready, we are looking forward to seeing what they all have to offer and how many awards we can bring home to the Caribbean next year. The ADDY deadline is January 14th, 2014 for work published between January 1st, 2013 and December 31st, 2013. TORONTO, March 14, 2013 /PRNewswire/ – Today, through Scotiabank’s global philanthropic program, Bright Future, the Bank announced a pledge of $1 million to support the Caribbean-SickKids Paediatric Cancer and Blood Disorders Project. These funds will be used to support the project’s telemedicine programs in Barbados, Jamaica, St. Lucia, St. Vincent and the Grenadines, Trinidad and Tobago, and The Bahamas. Through SickKids Foundation, Scotiabank also previously pledged $1 million to the International Patient Program. In the Caribbean, there is often a combination of factors that negatively impact on the ability to deliver clinical care, including: a lack of medical professionals with specialized training in paediatric cancer care; limited technological resources which often prohibits proper diagnoses; few nurses and pharmacists able to provide specialized front-line health care; and limited data on the effectiveness of treatments and epidemiology of paediatric cancer. Working with local hospital partners in the Caribbean, the Caribbean-SickKids Paediatric Cancer and Blood Disorders Project includes a five-year plan to address the region’s gaps in research, care and education in order to advance the diagnosis and management of paediatric cancer and blood disorders. Elements of this five-year plan include using telemedicine, physician envoys, and the SickKids International Learner Programme to provide customized, hands-on training to local individuals, establishing and maintaining a patient registry to provide high-quality data and key outcomes, and increasing the knowledge of primary care practitioners and pharmacists in the region to improve cancer care access. Trainees will also travel from the Caribbean to SickKids on a regular basis for hands-on training and experience within the Garron Family Cancer Centre at SickKids. For more information on the Caribbean-SickKids Paediatric Cancer and Blood Disorders Project, please visit www.sickkidsfoundation.com/caribbean. To watch a video about the Project, please visit: http://www.youtube.com/watch?v=xvntNAnvuSY. Established in 1972, SickKids Foundation raises funds on behalf of The Hospital for Sick Children (SickKids) and is the largest charitable funder of child health research, learning and care in Canada. Philanthropy is a critical source of funding for SickKids — one of the world’s foremost paediatric health-care institutions. For the fiscal year ending March 31, 2012, SickKids Foundation made an investment of $61.3 million in children’s health, a direct result of community and corporate support. For more information, please visit www.sickkidsfoundation.com. MONTREAL and BARBADOS, May 18, 2012 /PRNewswire/ — Irosoft Inc., a worldwide leader in Acts and subsidiary legislation management solutions, in partnership with ESI Technologies Inc., is proud to announce the successful implementation of its LIMS Drafting and Consolidating solutions for the Government of Barbados. “We are honoured to have been part of the LIMS project in Barbados for many reasons,” said René-Luc Morin. Vice-president and co-founder of Irosoft, Morin was in Bridgetown to complete the assignment and attend the official launch of the system held by the Attorney General and Minister of Home Affairs, the Hon. Adriel D. Brathwaite. “Barbados can now manage its legislation using the latest and most advanced fully integrated system on the market,” Morin adds. “Our Irosoft LIMS implementation is now in full production in Barbados, and legislative drafters are already seeing the benefits of not having to deal with many repetitive and tedious tasks. Those involved in the consolidation process now have an easy-to-use, semi-automated system that respects the legal principal of ‘point-in-time’. Founded in 1995, Irosoft is a world leader in Document/Record Management and Legal Information Management. As a specialist in integrated content management, Irosoft offers innovative and easy-to-use solutions so that clients can simply and efficiently develop, organize, exploit and preserve their information capital. To date, more than 100 national and international organizations — government departments and agencies, municipalities, as well as private companies — have come to Irosoft to carry out large-scale content management projects. CaribPR Wire, New York, NY (February 29, 2012) – True savings only come once every four years. This Leap Year, on February 29th only, visitors can save on their hotel stay when they book travel to Barbados at over 25 participating hotels and attractions. This one time Leap to Barbados special gives travelers a chance to leap away to the sun-drenched island to experience an unforgettable vacation retreat. In celebration of Leap Day, those who book a minimum 5 night stay at any participating property pay only $29 for the first night. This fantastic cost savings is the perfect reason to escape to this lush Caribbean island – offering travelers a destination rich in history, culture, food, music, and a passion for living life to its fullest. Additionally, travelers have the chance to complement their hotel stay in Barbados with an extraordinary underwater experience at Atlantis Submarines, offering $29 off the full price for the first person in each party. Moreover, Island Safari is offering $29 off per couple on the 4×4 Adventure Safari with Full Day Lunch Tour. Book your stay on February 29th, 2012 for travel through December 20th, 2012 by visiting http://Bookings.BookBarbadosNow.com using promo code: LEAP and start saving. Early checkouts are not permitted. Major US airlines offer easy and convenient services for travelers to Barbados from all major US gateways. American Airlines offers a daily non-stop service from New York’s John F. Kennedy International Airport and two daily from Miami International. Non-stop service is also available from Dallas Fort Worth International. American Eagle also offers a non-stop from San Juan with connections from most US gateways. Visit www.aa.com for reservations. JetBlue Airways offers a daily non-stop service between New York’s John F. Kennedy International Airport and Grantley Adams International Airport in Bridgetown, Barbados with some connections from their key gateways. Visit www.jetblue.com for reservations. US Airways offers weekly non-stop flights from Charlotte and offers travelers convenient connections from points within the U.S. to the island. Visit www.usairways.com for reservations. The island of Barbados offers the most authentic Caribbean experience with its exceptionally rich culture and history rooted in remarkable landscapes. Rated as one of the world’s sexiest beaches in 2008 by Concierge.com; Barbados’ Crane Beach in St. Philip stands as a premier destination for travelers. Barbados is also the first Zagat-rated Caribbean island with numerous internationally renowned chefs who masterfully put signature spins on local delicacies and traditions. Barbados is an ideal stage for world-class events and in collaboration with American Express Publishing Corporation, Barbados has hosted its first annual Barbados Food & Wine and Rum Festival in November 2010. The country has also hosted numerous athletic championships, including the 2006 PGA World Golf Championships-Barbados World Cup, the ICC Cricket World Cup Finals in 2007, the Sentebale Charity Polo match with Prince Harry of Wales in 2010, and the ICC Twenty20 Cricket Finals for 2010. Accommodations range from picturesque plantation houses and villas, to quaint bed and breakfasts and award-winning, five-star resorts. Grantley Adams International Airport offers even more non-stop and direct service from a growing number of U.S. cities via Jet Blue and American Airlines, making Barbados the true gateway to the Eastern Caribbean. Barbados was voted eighth in the World by Trip Advisor’s ‘2008 Travelers Choice Destination Awards’ in its Top 100 Destinations category. For more information on travel to Barbados, visit www.visitbarbados.org, follow on Facebook at http://www.facebook.com/VisitBarbados, via Twitter @Barbados or contact the Barbados Tourism Authority at 1.800.221.9831. MIAMI, Jan. 18, 2012 /PRNewswire/ — The Antigua Hotels & Tourist Association (AH&TA) have signed an agreement with Regatta Travel Solutions to launch BookAntiguaNow.com. Regatta has launched similar projects in Puerto Rico, Barbados, Grenada and Jamaica, and is preparing to announce several more projects in the region. www.bookantiguanow.com was recently launched, and the accommodations providers are now in the process of getting their properties online. The Antigua Hotels & Tourist Association is a non-government organisation and the representative voice of the local tourism private sector with a membership which comprises hotels, airlines and nearly 50 other tourism-related entities. Visit antiguahotels.org for more details. Founded by Ashwin Kamlani, Regatta Travel Solutions provides specialized online booking technology and marketing tactics for DMOs (Destination Marketing Organizations). DMOs that use Regatta to book travel on their sites can increase demand for their destination, lower the cost paid by suppliers per booking, and increase membership and participation for their organizations. Visit www.regattatravelsolutions.com for more details. BRIDGETOWN, Barbados, Sept. 28, 2011 /PRNewswire/ — Plans are well underway for the Caribbean Shipping Association’s (CSA) 41st Annual General Meeting (AGM) next month, October 10 -12 at the Hilton Barbados. The CSA is the voice of the region’s shipping industry and a major regional forum in which matters relevant to the growth and development of Caribbean shipping are discussed. Officials of the Association, which is headquartered in Jamaica, were in Barbados recently finalizing the plans for the event with local partners, Barbados Port Inc. and the Shipping Association of Barbados (SAB). Immediate Past President of CSA, Fernando Rivera said that he was pleased with the headway that Barbados had made in planning for the AGM; and with the social events planned that will enhance the experience of attendees for this very special 40th Anniversary meeting. Among the issues to be discussed will be the Business and Economic Outlook for Global Trade and Cruise Tourism, Integrated Regional Approach to Logistics, Distribution and Warehousing, Lessons Learned from the Gulf Oil Spill, Forces Shaping Cruise Lines Deployment Decisions, Global Supply Chain, Maritime Transportation and the Caribbean Transshipment Market, Terminals/Ports of the Future and NVOCC Perspective and The Changing Role of the Traditional Ship Agent. The AGM is expected to attract participation not only from Caribbean members but from its wider membership which includes companies as far as the UK, France, Holland, China and Germany. After Bermuda, New Brunswick and Quebec City, it’s now Barbados’ turn to entrust Irosoft with the automation of its legislative drafting, consolidation and publication processes. MONTREAL, June 2, 2011 /PRNewswire/ — Montreal’s Irosoft, world leader in Acts and regulations management solutions, in collaboration with Montreal’s ESI Technologies, signs an agreement with the Government of Barbados for the implementation of its LIMS suite, a complete legislative management system. Irosoft is proud to announce the signing of this contract with the Government of Barbados, a contract that consolidates LIMS’s positioning on the world stage. ”What makes our platform unique is the fact that is covers every step of legal documentation production in an integrated way,” adds Mr. Lavoie. Indeed, Irosoft’s LIMS platform is one of the few complete solutions currently on the market that enable national, provincial and municipal governments to manage their Acts or their regulations, whether unilingual or bilingual, from drafting all the way to publication. Furthermore, LIMS enables users to search for and reconstruct Acts and regulations for a specific point in time and to visualize provisions that have been assented to, but that are not yet in force. LIMS is currently being used by the Departments of Justice Bermuda, Quebec and New Brunswick as well as by Quebec City. Part of the suite is also being used by the Government of the Bahamas. Founded in 1995, Irosoft is a world leader in Document/Record Management and Legal Information Management. As a specialist in integrated content management for the past 15 years, Irosoft offers innovative and easy to use solutions so that clients can simply and efficiently develop, organize, exploit and preserve their information capital. To date, more than 100 national and international organizations — government departments and agencies, municipalities, as well as private companies — have come to Irosoft to carry out large-scale content management projects. MIAMI, May 31, 2011 /PRNewswire/ — The Barbados Hotel & Tourism Association (BHTA) has signed an agreement with Regatta Travel Solutions to launch BookBarbadosNow.com. The site aims to become the primary resource for information and reservations for hotels and activities in the destination of Barbados. Regatta recently announced the official release of its private label OTA Software (Online Travel Agency) and the signing of its first agreement with Puerto Rico. Now Regatta will also work hand in hand with Barbados to attract more travelers to the destination while reducing the cost of each booking to suppliers. The initial phase of www.BookBarbadosNow.com is live and has already generated bookings for the destination. The Barbados Hotel & Tourism Association was established in 1952. Their mission is “Bringing people, research knowledge and technology together to resolve challenges of business and to stage a world class experience and performance.” Visit bhta.org for more details. Founded by Ashwin Kamlani, Regatta Travel Solutions provides specialized online booking technology and marketing tactics for DMOs (Destination Marketing Organizations). DMOs that use Regatta to book travel on their sites can increase demand for their destination, lower the cost paid by suppliers per booking, and increase membership and participation for their organizations. Visit www.hotelinternethelp.com for more details. CaribPR Wire, Bridgetown, Barbados, Tues. April 26, 2011: Artisans have been invited to exhibit their products at the region’s foremost trade show, Design Caribbean, offering unique access to important regional and international buyers, in addition to massive market opportunities presented in Dominican Republic with a population of 10 million people. Over the past month we have had an outstanding response from artisans in the Caribbean anxious to be part of the upcoming Design Caribbean trade fair in Santo Domingo, Dominican Republic. All artisans engaged in art and design in the Caribbean region are eligible to participate in the Design Caribbean trade show. We are seeking quality products from diverse creative specialties including but not limited to ceramics, jewellery, fashion accessories, home furnishings, spa and wellness items, specialty foods and leather goods. A number of cash awards and incentives will be awarded in each category. For participation criteria and sign up details, please email info@designcaribbean.com or visitwww.designcaribbean.com for application forms. Information can also be gathered at www.facebook.com/DesignCaribbean. From September 1-4, 2011 in Santo Domingo, Dominican Republic, Design Caribbean will unite a passion for design with the soul of the Caribbean. All products on display will have been vetted for excellence. In Barbados during the official launch of the 10th European Development Fund (EDF), attendees were given the first sneak peek of some of the exciting product that will be part of the upcoming fair. Alongside the main trade fair, Design Caribbean, there will be many related events including a major musical event, a film programme, the remarkable rums experience, a specialty tea tent, spa and wellness as well as a fashion show. Participating artisans will also have the opportunity to attend a number of product and market development workshops on hot topics such as intellectual property rights, growing a business and accessing foreign markets. Inspired by the passion and talent of both distinguished and aspiring artists, Design Caribbean brings the region’s finest handmade designs and innovative products onto the world stage. Encapsulating the spirit of design to “celebrate the ‘beautiful” our event takes place in Santo Domingo, Dominican Republic from Sept. 1-4, 2011. Showcasing a broad product range of handmade quality products, it will connect artists to buyers, and design enthusiasts from the Caribbean region, North America and Europe. Design Caribbean visitors will come away with a true sense of the diversity and splendor that breathes vibrancy into the Caribbean region. CaribPR Wire, MIAMI, FL, Weds. April 6, 2011: BlackBerry® Travel™, an application that provides BlackBerry® smartphone users with an all-in-one integrated tool to plan, book, manage and share travel activities quickly and easily, is now available in the major markets of the Caribbean. The new app was recently announced in February at MWC 2011 in Barcelona and is now ready for download for BlackBerry users in the following markets: Trinidad and Tobago, Jamaica, Barbados, Puerto Rico, Bermuda, Bahamas, Aruba, Cayman Islands, Virgin Islands and US Virgin Islands. The BlackBerry Travel app offers convenient push notifications and seamless integration of travel itineraries and flight status updates into the familiar BlackBerry Calendar. When a new booking confirmation or itinerary arrives in the user’s email inbox, the BlackBerry Travel app is automatically updated with the relevant itinerary details, which makes travel planning and management easier than ever. With the BlackBerry push technology, the BlackBerry Travel app can keep users informed and in control of their itineraries by monitoring flight statuses and promptly providing notifications about changes to their flight information. The app can even identify potential omissions or scheduling concerns with their itineraries, such as missing accommodations or timing conflicts, and provide users with suggestions. In addition, BlackBerry smartphone users can share their travel information with colleagues, friends and family over email or through LinkedIn®, directly from the BlackBerry Travel app. The LinkedIn integration allows users to search for people in their network who will be in the same city, send messages to contacts and update their status. The BlackBerry Travel app also features a web component that allows users to book flights and car rentals, as well as edit and print itineraries, from their computer. The BlackBerry Travel app was built in collaboration with WorldMate, a leader in mobile travel platforms. WorldMate and RIM are working together with leaders in the travel industries such as Continental Airlines, Expedia Affiliate Network, Hilton Worldwide, Starwood Hotels and Resorts, United Airlines to provide BlackBerry Travel app users with an amazing mobile experience. * BlackBerry Travel is available at launch for the BlackBerry® Bold™, BlackBerry® Curve™, BlackBerry® Storm™ and BlackBerry® Torch™ series of smartphones. Aruba, Bahamas, Barbados, Bermuda, Blackberry Travel App, Caribbean Markets, Cayman Islands, Jamaica, puerto rico, RIM, Trinidad and Tobago, Virgin Islands and US Virgin Islands. CaribPR Wire, Barbados, March 2, 2011: Artisans from the Caribbean region are invited to exhibit their products at the region’s foremost trade show, Design Caribbean, which offers unique access to important regional, international and diaspora buyers. From September 1-4, 2011 in Santo Domingo, Dominican Republic, Design Caribbean will unite a passion for design with the soul of the Caribbean. All products are vetted for excellence so only the best of the region will be on show. Alongside the main trade fair, there will be many related events including a major musical event, a film programme, spa and wellness and a fashion show. Participating artisans will also attend a number of product and market development workshops on hot topics such as copyright, growing a business and accessing foreign markets. Design Caribbean will attract buyers from North America, Europe and the Caribbean region. This year promises to be a notable event that no artisan should miss. If you want your products to reach a global marketplace, please register your interest immediately as places are limited. 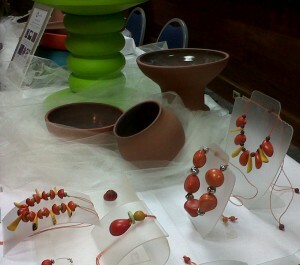 All artisans engaged in design in the Caribbean region are eligible to participate in the Design Caribbean trade show. We are seeking products from diverse creative specialties including but not limited to ceramics, jewellery, fashion accessories, home furnishings, spa and wellness items and leather goods. In addition, there will a number of cash awards and incentives for winning various design categories. For participation criteria and sign up details, please email info@designcaribbean.com. “Design Caribbean is an opportunity for exhibitors and visitors to experience the Caribbean, where all cultures collide to create something beautiful,” says Pamela Coke-Hamilton, Executive Director of the Caribbean Export Development Agency (Caribbean Export), organisers of the event. Participants will leave the show inspired and invigorated by the creative splendor of the Caribbean and new business insight. Encapsulating the spirit of design to celebrate the ‘beautiful,’ our event takes place in Santo Domingo, Dominican Republic from Sept. 1-4, 2011. Showcasing a broad product range of handmade quality products, it will connect artists to buyers, and design enthusiasts from the Caribbean region, North America and Europe. Design Caribbean visitors will come away with a true sense of the diversity and splendor that breathes vibrancy into the Caribbean region. HALIFAX, Nova Scotia, Jan. 25, 2011 /PRNewswire/ — Emera Inc. (”Emera” – Toronto Stock Exchange listing “EMA”) wishes to advise all shareholders of Light & Power Holdings Ltd. (”Light & Power Holdings” – Barbados Stock Exchange listing: “LPH”) that the offer to purchase all issued and outstanding common shares in Light & Power Holdings at a cash price per share of BB$25.70 (twenty five Barbados dollars and seventy Barbados cents) closed as of 5 pm on January 24, 2011. 7,129,269 shares of LPH were deposited in response to the offer and Emera announced today that it will purchase all deposited shares. If the tender and acceptance of all shares is confirmed by the Barbados Stock Exchange as valid, this will increase Emera’s ownership in LPH to 79.74 per cent. This 41.43 per cent additional investment will make Emera the majority shareholder in LPH. The remaining shares of LPH are primarily held by 1,700 Barbadian shareholder accounts, including the National Insurance Board of Barbados. Payments for deposited shares will be made to shareholders by January 31, 2011. The transaction is expected to close in the first quarter. Light & Power Holdings is the parent company of The Barbados Light & Power Company Limited (”BLPC”). BLPC is the sole electric utility operator on the island of Barbados, serving 120,000 customers. BLPC has three power generation stations consisting of 239 MW of installed capacity. This release contains forward-looking information and should not be read as a guarantee of future events, performance or results, and will not necessarily be an accurate indication of whether, or the times at which, such events, performance or results will be achieved. Emera disclaims any intention or obligation to update or revise any forward-looking information, whether as a result of new information, future events or otherwise, except as required under applicable securities laws. (EMA and EMA.PR.A – TSX) is an energy and services company with $5.8 billion Canadian dollars in assets. Electricity is Emera’s core business. Approximately 94% of Emera’s revenues are earned by Nova Scotia Power Inc (NSPI), Bangor Hydro Electric Company (BHE) and the Brunswick Pipeline. NSPI and BHE are wholly-owned regulated electric utilities which together serve 603,000 customers. The Brunswick Pipeline is a 145 km gas pipeline in New Brunswick. Emera also owns Maine and Maritimes Corporation, the parent company of Maine Public Service Company, a regulated electric utility serving approximately 36,000 electricity customers in Northern Maine, and MAM Services Group. In the Caribbean, Emera owns 19% of St. Lucia Electricity Services Limited, which serves more than 50,000 customers on the island of St. Lucia; 80.4% of Grand Bahama Power Company which serves 19,000 customers on the island of Grand Bahama; and 38% of Light & Power Holdings which serves 120,000 customers on the island of Barbados through its regulated electric utility The Barbados Light and Power Company. As well, Emera owns 8.2% of Algonquin Power & Utilities Corp. and 50% of Calpeco which serves 47,000 customers in California. In addition to its electric utility investments, Emera owns Bayside Power, a 260 MW gas-fired power plant in Saint John, New Brunswick; Emera Energy Services, a physical natural gas and power marketing and asset management business; a joint venture interest in Bear Swamp, a 600 megawatt pumped storage hydro-electric facility in northern Massachusetts; a 12.9% interest in the Maritimes & Northeast Pipeline; and an 8.2% interest in Open Hydro. Visit Emera on the web at www.emera.com . CaribPR Wire, Toronto, Canada, October 7, 2010 – As part of a campaign to identify and link up with Barbadians across the world, and register their skills and qualifications, Invest Barbados, an economic development agency for Barbados, has launched a new campaign called, “Return to the Rock,” in which eligible participants could win a free trip for two people to Barbados. The winning flights will be booked for the final week during Crop Over 2011. This five-week summer Festival has turned into a cultural and culinary extravaganza that attracts thousands of international visitors every year to Barbados. Governmental changes, legislative shifts, that could directly impact business on and off the island. Ability to invest in the development of Barbados and access new initiatives on the ground level. Inside access to reach local Barbadians and exclusive ability to post projects (business opportunities) for local responses on the site, the ‘go to’ location for entrepreneurs as well as long-standing business owners. Sector trends that help to highlight various business and growth opportunities. Wide array of specific investment prospects from government debentures to real estate developments. Invest Barbados (IB) is the economic development agency of the government of Barbados that is responsible for attracting, winning and sustaining foreign direct investment in, and through Barbados, utilizing its international tax treaties, into other countries. The corporation is also responsible for promoting the export of indigenous services and helping to develop and manage the Barbados Business brand. BRIDGETOWN, Barbados, May 6 /PRNewswire/ — A new environmental study sharply critical of the Government of Barbados shows the key Graeme Hall mangrove wetland is disappearing due to outside pollution and poor water quality. The Graeme Hall wetland is the last remaining mangrove in Barbados — a red mangrove forest that has existed for no less than 1,300 years. It is the only wetland in Barbados recognized internationally under the Convention on Wetlands of International Importance (Ramsar). It acts as a Caribbean flyway stop for migratory birds between North and South America. The extensive 800-page study (www.graemehall.com/press/papers/Graeme Hall 043010 MEA.pdf) prepared for the Graeme Hall Nature Sanctuary by Environmental Engineering Consultants of Tampa, Florida shows the Sanctuary has suffered a 77 per cent reduction in salinity in the past ten years due to an inoperative government-run sluice gate. The huge reduction signals “an inevitable failure of the mangrove ecosystem” as freshwater flora and fauna take over. The study also cites damaging factors including: dumping of raw sewage into the wetland instead of the sea by the South Coast Sewage Treatment Plant; contaminated storm water runoff originating from 1,150 acres of government-managed drainage systems; and, commercial and residential pollutants from adjoining properties. The original environmental investment was based on the area being protected as a brackish mangrove ecosystem. Graeme Hall Nature Sanctuary occupies 42 per cent of the Ramsar wetland at Graeme Hall, and is owned by Peter Allard, a Canadian investor and philanthropist who has put more than US $35 million into the 35-acre eco-tourism site to preserve the last significant mangrove woodland and wetland on the island. The Sanctuary in fact closed its doors to the general public in late 2008 when problems of pollution and water quality became overwhelming. ”This isn’t just a problem for the Ramsar environmental wetland and our investment, it’s also a health and human welfare problem for the people of Barbados,” said Allard. Despite a 6,000 signature petition by citizens of Barbados to create a 240-acre national park at Graeme Hall, a new government zoning policy calls for commercial and residential development for the majority of the area. As the Canadian owner of the Sanctuary, Allard has filed several complaints alleging that the Government of Barbados has violated its international obligations by refusing to enforce its environmental laws, thereby allowing increased pollution and land development to damage the Sanctuary. Emera to Acquire a 38% Interest in Light & Power Holdings Ltd.
HALIFAX, Nova Scotia, May 3 /PRNewswire/ – Today, Emera (TSX: EMA) announced that it will acquire a 38% interest in Light & Power Holdings Ltd. (Barbados Stock Exchange: “LPH”) from Leucadia National Corporation (”Leucadia”). Under the terms of the agreement with Leucadia, Emera will acquire the interest from Leucadia for US $85million. LPH is the parent company of The Barbados Light & Power Company Limited. (BLPC) BLPC is the sole utility operator on the island of Barbados, serving 120,000 customers. BLPC has three power generation stations consisting of 239 MW of installed capacity. There is a regulatory regime on the island that allows a full fuel pass through mechanism. The Board of LPH has said that “they welcome the investment of Emera” and that “the combined knowledge and experience of Emera and LPH in the electric utility business will maintain and enhance the technical strength and future prospects of BLPC for the continued benefit of electricity customers in Barbados”. This 38% investment will make Emera the largest single shareholder of LPH. Approximately 62% of LPH is locally held by 2,700 Barbadian shareholders, including the National Insurance Board of Barbados, which owns 23%. LPH is Emera’s third investment in the Caribbean. This follows a 19% investment in St. Lucia Electricity Services Limited (Lucelec), a vertically-integrated monopoly utility on the island of St. Lucia, and a 25% indirect interest in Grand Bahama Power Company (GBPC), a vertically-integrated electric utility on the Grand Bahama Island in The Bahamas. The transaction is expected to close in the second quarter and is not subject to regulatory approval. This transaction will be financed with existing credit facilities and is expected to be immediately accretive. Barbados is the most eastern island in the Caribbean, with a population of approximately 285,000. The government is a parliamentary democracy and the legal system is based on English common law. Canada enjoys a strong working relationship with Barbados, and Canadian companies make up approximately 75% of the international financial community on the island. Barbados enjoys one of the highest per capita incomes in the region, and tourism is the main economic activity. This news release contains forward looking information. Actual future results may differ materially. Additional financial and operational information is filed electronically with various securities commissions in Canada through the System for Electronic Document Analysis and Retrieval (SEDAR). Emera Inc. (TSX: EMA) is an energy and services company with $5.3 billion in assets. Electricity is Emera’s core business. Approximately 94% of Emera’s revenues are earned by Nova Scotia Power Inc (NSPI), Bangor Hydro Electric Company (BHE) and the Brunswick Pipeline. NSPI and BHE are wholly-owned regulated electric utilities which together serve 603,000 customers. The Brunswick Pipeline is a 145 km gas pipeline in New Brunswick. Emera also owns 19% of St. Lucia Electricity Services Limited, which serves more than 50,000 customers on the Caribbean island of St. Lucia and 25% of Grand Bahama Power Company which serves 19,000 customers on the Caribbean island of Grand Bahama in The Bahamas. In addition to its electric utility investments, Emera owns Bayside Power, a 260 MW gas-fired power plant in Saint John, New Brunswick; Emera Energy Services, a physical natural gas and power marketing and asset management business; a joint venture interest in Bear Swamp, a 600 megawatt pumped storage hydro-electric facility in northern Massachusetts; a 12.9% interest in the Maritimes & Northeast Pipeline; and an 8.2% interest in Open Hydro. Visit Emera on the web at www.emera.com.